Asphalt placed from sta. 509+25 to sta. 511+02 in the excavated median. Capitol Paving of DC (the contractor) continued the work along the eastbound side of Kennedy Street NW; they also started the work on the westbound and eastbound along Kennedy Street between Georgia Ave NW and North Capitol Street NW. The contractor furnished and installed 94 SY of PCC sidewalk, 60 LF of straight granite curb, 6 LF of circular granite curb and 2 wheelchair ramps. Jaxson Point (Capitol Paving’s sub-contractor) performed the electrical work by installing 53 linear feet of 1-2” electrical conduit, 30 linear feet of 6-4’ inch PVC conduit and 3 BC steel transformer base. Capitol Paving of DC (the contractor) continued the work along the eastbound side of Kennedy Street NW; they also started the work on the westbound and eastbound along Kennedy Street between Georgia Ave NW and North Capitol Street NW. The contractor completed one (1) fire hydrant removal and reinstallation, installed four (4) standard double basins, 35 linear feet of 15” RCP pipe and 11 linear feet 18” RCP pipe. They also installed 54 SY of brick sidewalk, 73 LF of straight granite curb, 110 LF of circular granite curb, 13 CY of driveway/alley concrete and removed five (5) trees. Jaxson Point (Capitol Paving’s sub-contractor) performed the electrical work by installing 340 linear feet of 4” electrical conduit and 126 linear feet of 2” inch PVC conduit. 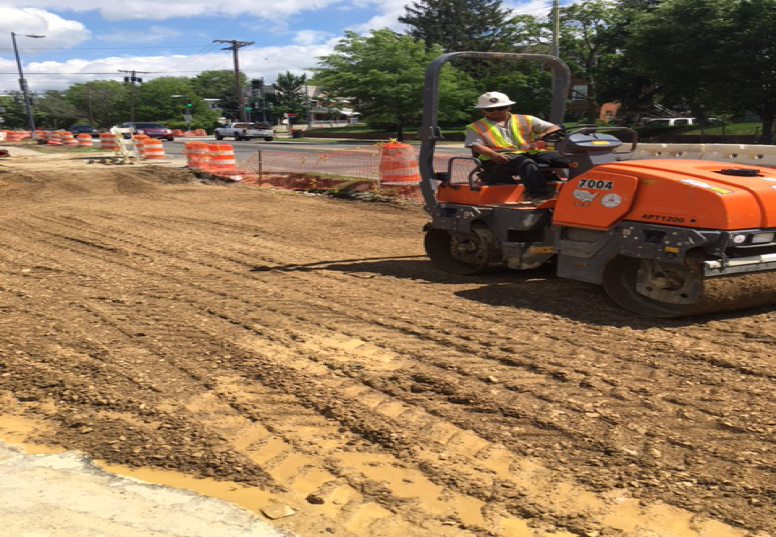 Capital Paving installing rebar’s in seat wall footing in front of building #100. Capitol Paving of DC (the contractor) continued the work along Kennedy Street NW; between Georgia Ave NW and North Capitol Street NW. 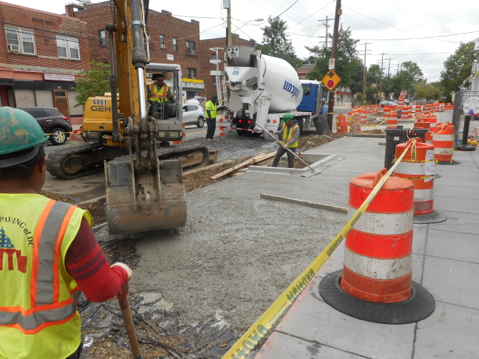 The contractor furnished and installed one (1) modified standard double basin at Kansas Ave NW and Missouri Ave NW intersection. Besides, they installed about 93 linear feet of straight granite curb, 21 linear feet of circular granite curb and two (2) wheelchair ramps. Capitol paving also poured concrete for the seat wall and tree boxes at the south side of 100 block at Kennedy Street NW. 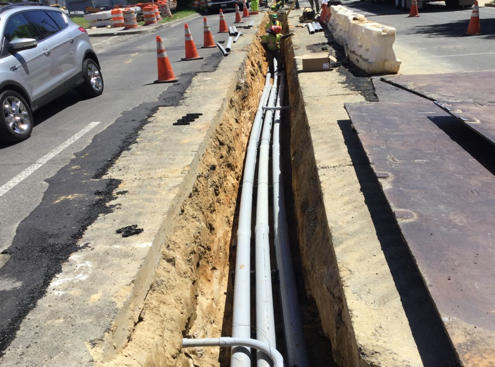 Jaxson Point (Capitol Paving’s sub-contractor) performed the electrical work by installing 5 linear feet of 1 (2”) and 1 (4”) and 32 linear feet of four (4) 4” electrical conduit for the traffic lights. Also, they installed 25 linear feet of six (6) 4” PVC conduits, 95 linear feet of six (6) 4” and one (1) 2” PVC conduits and 21 linear feet of six (6) 4” and two (2) 2” PVC conduits for the street lights.